We are a diverse community rooted in the Catholic Faith, fostering spiritual development, high student achievement, responsibility to self, and service to others. St. Joseph students are inspired by a rich cultural experience of faith, service, and intellectual discovery. They are compassionate leaders, equipped to continue lifelong learning, serving their community, and responding with confidence to challenges and opportunities. St. Joseph Catholic School enables each member of our Christian educational community to integrate learning experiences and life choices with the message of Jesus. St. Joseph Catholic School community provides opportunity for growth within each student’s capacity for learning. We facilitate the learning of academic and technological skills necessary to acquire knowledge and to make positive contributions to society. We support and encourage all facets of our co-curricular fine arts program in recognition of how essential creativity and expression are in the lives of our students. St. Joseph Catholic School builds a community in which all cultures are valued and all students are welcomed. St. Joseph Catholic School fosters an atmosphere of Christian appreciation for the care of spirit, mind and body. Each member of our school community is encouraged to make creative and responsible contributions to society. encounters Jesus in the Gospels, experiences a personal and communal relationship with God through prayer and participation in liturgical celebrations, including the Sacraments of Reconciliation, Holy Eucharist, and Confirmation. uses Christian conscience and principles in life choices, acting with moral courage incorporating the community agreements of “Mutual Respect”, “Appreciation”, “Attentive Listening”, and “Right to Pass”. can think critically, logically, and analytically. is a life-long learner who reads for knowledge as well as pleasure. continues to develop good communication skills in writing, speaking, and social interactions. self-confidently sets high personal standards while accepting his/her gifts and limitations. develops empathy for the larger community by participation in service to others. is informed and has a willingness to act on local and global issues. differentiates between right and wrong, and chooses right even in the face of countercultural and societal pressures. takes the initiative to seek challenge and growth in personal areas of interest. applies what is learned to extracurricular activities. respects his/her body by making healthy lifestyle choices. who values leadership experiences as well as opportunities for cooperative learning. 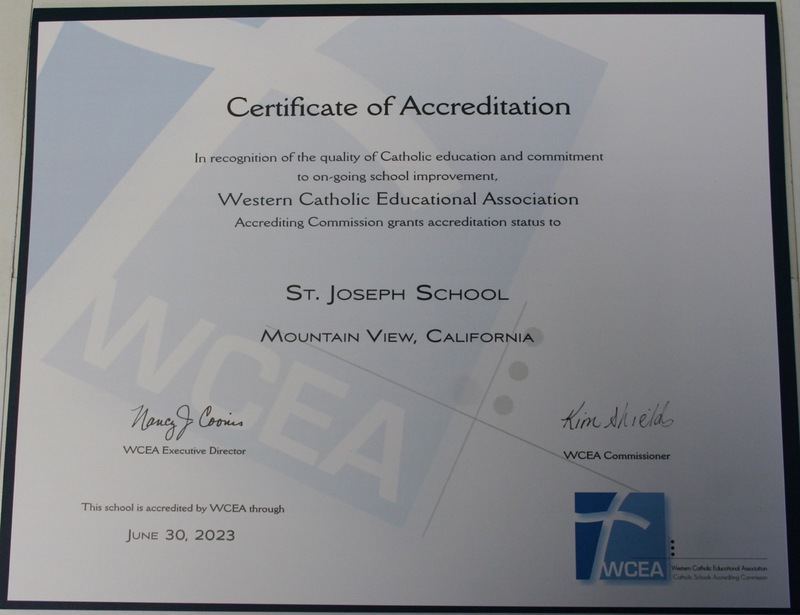 Our Western Catholic Educational Association accreditation process was completed in February of 2017 by an on site evaluation by a six member visiting committee made up of supervisors, principals, and teachers. We were awarded a six year term, the highest rating available. St. Joseph is officially accredited through June 30th, 2023.